There’s no question in my mind that Timbuk2 makes some of the best messenger bags, backpacks, tote bags and laptop bags around. Plus they are an awesome independent, local San Francisco company that’s been around 18 years, with a great retail store in Hayes Valley. Over the years I’ve owned several Timbuk2 bags and they’ve all been great. Almost exactly a year ago I wrote about their Blogger Bag, a really great vertical laptop bag that for the most part has been my primary bag for the last year. Well that has all changed. They just came out with their new Hacker bag which I have ordered from them. This is quite possibly the ultimate vertical laptop bag, well for me at least. Plus, hackers are cooler than bloggers any day, right? The Hacker bag takes the Blogger bag to the next level, adding a waterproof liner and bottom, a molded back panel, enclosed padded, corduroy-lined laptop compartment and it also coverts into a backpack with straps that are normally hidden in the back, which are great for going on long hauls. In general, I prefer vertical laptop bags, since they take up less space, which is important when you’re at crowed art or tech events. 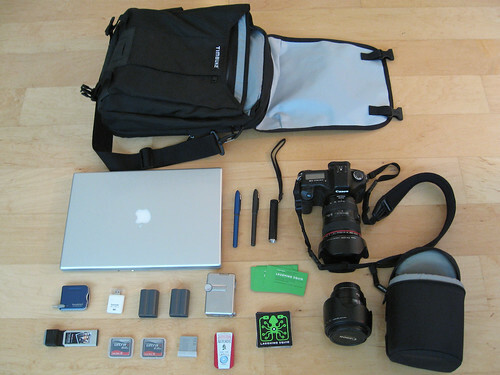 While we’re at it, I might as well do the whole “what’s in your bag?” thing. The Hacker bag easily fits my 15” Apple MacBook Pro, AC adapter, my Canon 5D DSLR camera with EF 24-105mm f/4 L IS lens attached (plus lens hood), Canon EF 35mm f/1.4 L prime lens, my CF cards & CF and SD card readers, batteries, Canon PowerShot TX-1 HD camera, Verizon V740 EVDO Rev A ExpressCard, pens, mini LED flashlight, business cards and Laughing Squid stickers, with plenty of room to spare. 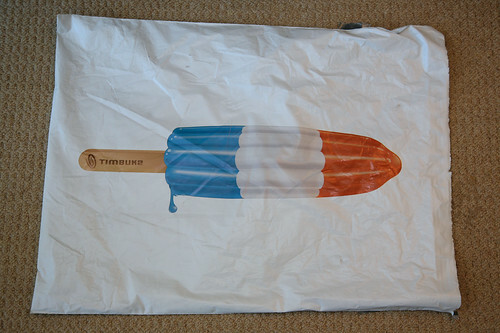 Oh and just to make a cool company even cooler, check out the awesome rocket popsicle mailer that the Hacker bag shipped in when I purchased it from Timbuk2. UPDATE: Some of you have been asking if I can shoot additional photos of the bag to help you determine if you should buy it or not. This is really something that Timbuk2 should be doing. I just wrote about how much I liked it, but I really donâ€™t have the time or resources to setup extensive products shots of the bag. 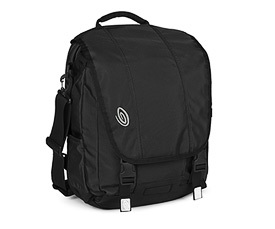 I would suggest that you contact Timbuk2 and ask them to add more photos of the bag.